A woman in Alaska sent in a piece of wood from a birch tree which had shown traces of fluorescence. A Texas rancher sent in samples of earth from his ranch because he stated that when his cows walked in the area from which the earth came they invariably collapsed. Another citizen reported that he had seen a ball of fire rolling in the valley and that this was evidence of uranium. He was asked to provide a sample. One recent sample was carefully packed in a hot-water bottle, probably to shield the public from radioactivity which it failed to possess. The latest important discovery was made by a smart Canadian prospector, Robert Campbell, who did his preliminary exploration work in a Toronto library. Poring over reports of prospectors who had sought copper ore a century ago, Campbell found that some of the reports mentioned deposits of uranium about 70 miles north of Sault Ste. Marie. Uranium was worthless 100 years ago and no one bothered to work the mineral or even to describe exactly its location. Equipped with a Geiger-Mueller radiation meter, Campbell spent most of last summer in the region covered by the reports, probing the rocky shore of Lake Superior and climbing 1000-foot cliffs in his search. Week after week his earphones gave out only the normal background response, then while exploring a place called Alona Bay the earphones began to buzz wildly. He was standing within a few feet of a two-inch seam of black pitchblende. Ore that runs 10 percent uranium is considered very valuable; Campbell’s discovery has a 60 percent radioactive content. Today, 500 claims or more have been staked out surrounding his find. From now on the United States and the whole world can hardly find enough uranium and thorium to satisfy their needs. As producers of energy and for military uses, rich radioactive minerals are far more precious than gold. Canada, Belgian Congo and Czechoslovakia contain the principal known deposits. In the United States, uranium-bearing ores have come mainly from an area on the Colorado-Utah border. A recent pitchblende strike was made near Boulder, Colo. Deposits of low-grade materials so poor that they are not worth working with present techniques occur in many parts of the country. 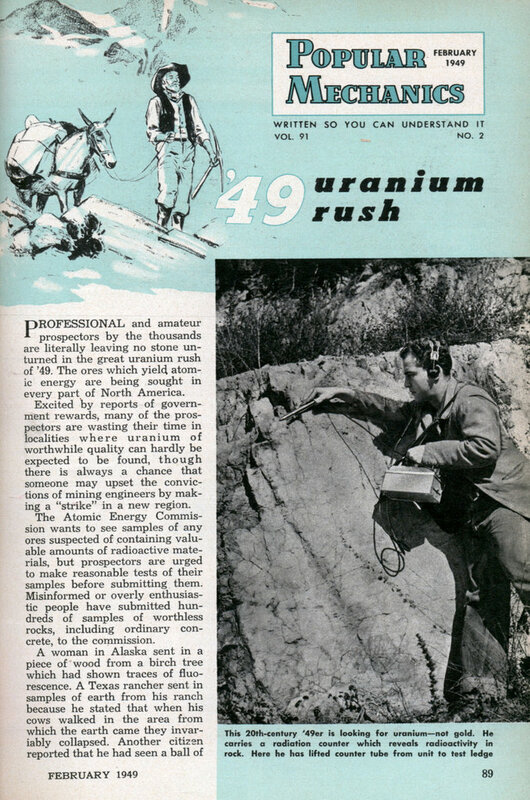 Nevertheless the Atomic Energy Commission desires desperately to uncover any new sources of worthwhile ore and the commission has announced that a $10,000 prize or bonus will be paid for the delivery of 20 tons of ore or concentrates that assay 20 percent or more in uranium oxide, provided that the material comes from a new, previously unworked deposit. In addition the commission will pay for the ore at the ordinary price. The offer applies to any discoveries inside the United States, its territories, possessions and the Canal Zone. The offer does not apply to carnotite-type ores of the Colorado plateau, neither is the reward paid simply for discovery or report of a new ore body. Twenty tons of good material must be delivered before the prospector can collect. The guaranteed minimum AEC price for uranium ores is at the rate of $3.50 per pound of uranium oxide that is recoverable from the ore, less refining costs, plus allowances for other valuable minerals that may be contained in the ore. Car-notite ores are priced on a different schedule at rates that vary from 30 cents to $1.50 per pound of contained uranium oxide, plus certain bonuses, plus allowances for other valuable constituents. Carnotite purchases are made in minimum lots of 10 tons. Ores that assay less than 0.10 percent uranium oxide or that contain excessive quantities of lime are not purchased. In all there are more than 100 recognized uranium ores, of which only a few are rich in radioactivity. The so-called primary ores are the most valuable, these being massive pitchblende that runs from 50 to 80 percent uranium and from which radium is also extracted, and crystalline uraninite, 65 to 80 percent uranium. Each is apt to occur in veins or dikes scattered through quartz formations. Each is dark, heavy, brittle and metallic or subme-tallic in appearance. Pitchblende may be associated with silver, nickel, or other metals, while uraninite often occurs in or near a deposit of black mica. Any dark, heavy mineral that is discovered in a pegmatite formation should be tested for possible uranium content. Black tourmaline and hornblende, often mistaken for uranium, are of a lighter weight with translucent splinters. The secondary group of uranium compounds includes carnotite and autunite, or tobernite. Some are rich enough to be valuable, some are simply impurities in the basic material. They may be found chemically united with lead, copper, or vanadium, among other elements, or they may occur as precipitated material in sedimentary formations. The secondary minerals are characteristically brilliant yellow, orange, or green, depending on associated elements, and they are apt to be found in the form of powdery crusts. Long exposure destroys their brilliant coloring. Colored crusts or veins near the surface, however, may be an indication of much richer ore below or nearby. The group of thorium minerals, also sought after because of their radioactivity, is often found in association with uranium. Different kinds of thorium may occur as cubes or other crystals and may be dark red, brown, or yellowish in color. Beach sands sometimes contain monazite crystals, one of the thorium minerals, just as they sometimes contain heavy black grains of primary uranium materials. The United States has very few known deposits of primary uranium and few, if any, of these are very extensive. Deposits of secondary compounds are found from Maine to California, along both coasts, and in many parts of the West. Some are high-grade, most are worthless; all are being sought and evaluated today. Principal center of prospecting activity ranges roughly from Holbrook, Ariz., to Grand Junction, Colo.
Prospecting for uranium can be hard work but detecting the material is easy. This is because of the uranium prospector’s newest tool, the Geiger-Mueller radiation meter that gives an immediate response when it is brought close to any radioactive material. Commercial portable models made especially for prospecting cost from $125 to $250 and thousands of them have been sold in the last few years. In this issue of Popular Mechanics (page 238) a lightweight portable model that you can build yourself for prospecting and for other uses is described in detail. Simply stated, the heart of a Geiger-Mueller radiation meter, often shortened to “Geiger counter,” is a glass tube filled with some nonconductive gas such as argon and “containing two electrodes. A potential of 800 volts, higher for some models, is placed across the two electrodes, the voltage being just under the amount required to cause a discharge across the gap. When a gamma ray from any source happens to enter the tube, it is attracted to the central positive electrode and the ray’s ionized path through the gas permits a momentary discharge from one electrode to the other. This discharge, amplified, is registered in the earphones as a click, or it may be indicated on a microammeter or even by the flashing of a small neon lamp. Current for the high potential and for amplification is furnished by batteries contained in the instrument’s case. normal radioactivity of the earth. A meter is apt to register from 5 to 50 random clicks a minutes and this so-called background must be disregarded when seeking radioactive materials. Before starting out it is best to count the clicks for 10 minutes and divide by 10 to establish the actual background count for any locality. 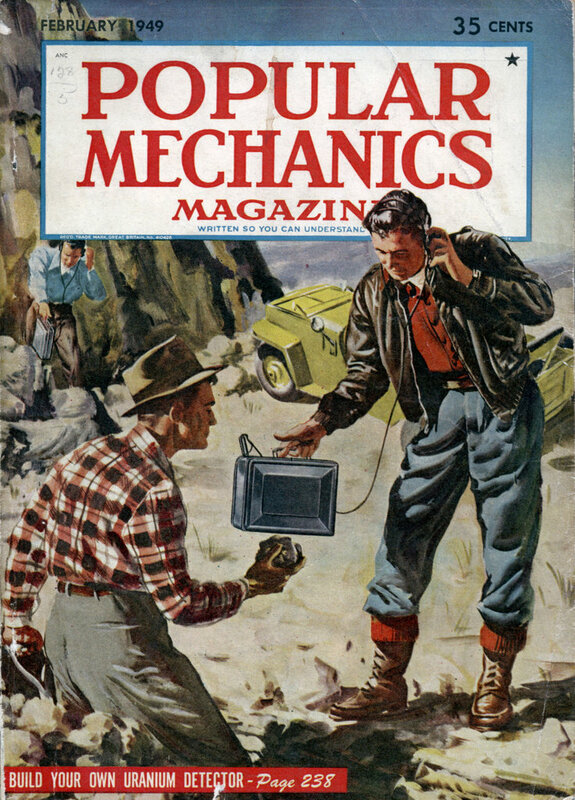 For normal prospecting the meter is simply carried across country or past likely formations at a slow walk while the operator listens or watches for any unusual change in the gamma-ray count. Variations in the count are apt to occur during a prospecting tour and the operator soon becomes familiar with these. Spurious counts, for instance, may be noticed at the approach of a thunderstorm. The normal background count is apt to fall off sharply when a gulley is entered. Contamination of the clothes by radioactive materials also can cause a count that has no significance as far as ‘prospecting is concerned. When in a known radioactive locality it is best to walk very slowly to watch for any unusual changes in the count. Three feet of earth overburden or rock capping can almost completely shield a vein of material that would give out a very rich count, if it were exposed. Careful prospectors who pick up an indication of radioactive ore use their meters for surveying the extent of the deposit, exposed or unexposed. They mark the area off into 20-foot squares and post a stake or pile of rocks at each intersection. At each corner they then take a one-minute stop-watch count and mark the count on a grid map. If a vein of radioactive material lies below, the completed grid map immediately reveals its length, breadth and direction. The Geiger counter is a dependable detector of radioactive materials but it is useless or virtually useless for estimating the richness of an ore. Even common country rock may cause an increase in the count if a sample is held close to the tube, due to the trace of radioactivity that the rock contains. The only sure way of learning the uranium or thorium content of a specimen is by spectroscopic analysis. The Geiger-Mueller radiation meter is the most popular tool for uranium prospecting but it is not the only one. Unexposed photographic film left for a day or two in a light-tight container on a possible body of uranium material will be found to be fogged when developed if the deposit was truly radioactive. Various types of electroscopes give an indication of radioactivity when such an ore is examined with one of the instruments. Ordinary old-fashioned panning, wet or dry, the same method used for detecting gold, is a useful field method of concentrating a mineral sample from the rock that contains it. Any dark, heavy concentrate that remains is likely to be valuable and might well be tested for a possible uranium content. Ultraviolet lamps whose rays cause numerous minerals to fluoresce in characteristic colors is a valuable aid in detecting some of the secondary uranium minerals. Recent reports that there is not enough uranium available for a long-term atomic energy program have been branded as false by David E. Lilienthal, chairman of the AEC. “The present search for uranium and the sources we have our hands upon provide an adequate supply and in the future will be sufficient,” says Lilienthal. Inquiries concerning worthwhile ores should be addressed to the Division of Raw Materials, U. S. Atomic Energy Commission, P.O. Box 30, Ansonia Station, New York 23, N. Y.